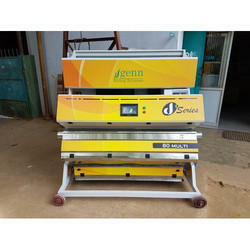 GENN D Series exclusively designed for variety of pulses. D series is the result of long studies focusing on realization of a machine with excellent sorting performances, user friendly and with reduced operation and maintenance costs. · Truly visualization technique achieved by dynamic capture at very speed and analyzing method. · High precision dedicated lens to receive images, which can distinguish the heterochromatic regions of 0.08 mm2 accurately. · 2048 Ultra high resolution linear scan camera with Double sided camera can gives excellent performance in process. · Camera information is quickly processed by Ultra-fast FPGA+DSP processor. · 65535 Mega colors TFT touch screen. · The high frequency ejector has a long service life and has very low air consumption, providing the highest capacity and low rejection output. 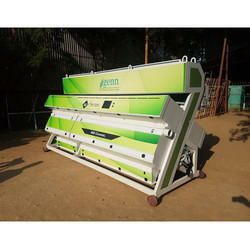 · Auto Reflector provision for variety of pulses. Leveraging over the skills of our qualified team of professionals, we are instrumental in offering wide range of Dal Sorter Machine. Our company holds immense experience in this domain and is involved in offering wide assortment of Wheat Sorter Machine(G++ Series).